Hello! I’m Renée Piane, The Love Designer, and I’m on a mission to ignite the hearts of busy, successful people around the world to Get Real about Love and reinvent their love lives. I am honored that you are here to learn more about me and discover how I can help you achieve your ultimate love vision. Together, we will navigate the wild world of relationships and dating as you open your heart to discover what you are looking for as you redesign your new lifestyle! After two decades in the love and dating industry, I’m proud to say that I’ve helped thousands of people find true love or get back out there after a divorce or separation. Now, it’s your turn! Choosing a life partner is one of the most important decisions of your life, yet most people rush into relationships or stay in unfulfilling situations that aren’t aligned with who they really are. We all have a calling in this life, and this is mine. I’m here to reignite your faith by sharing my expertise, resources and personal journey with you. Nothing makes me happier than to receive a love story or testimonial from a client who has found their match. Now, let’s find yours! My mission is to inspire you to slow down and get real with your heart to attract extraordinary love. With an open heart, anything is possible! You may have been referred to me by a friend, found me online searching for advice about a love “situation” or heard my message on radio or TV. It’s more than likely that you are just getting back in the dating game after a bad breakup or divorce and feel discouraged and confused. Perhaps you’re a single parent pondering if love is even possible anymore. You may have a great career, awesome friends and have finally made it to the top. Yet, you still wonder, “Where is that special partner to share all of my success?” You could be doubting yourself and are anxious about putting yourself back out there. Whatever your circumstances, your intuition has led you here. Have no fear, I know I can help open your heart to love again. I’m dedicated to helping you take charge of your love life and design a lifestyle that supports your ultimate vision. As a matchmaker for love and business, I have all the resources needed to transform your life. I consider myself to be an inspirational role model and mentor for people who are looking for love, healing a broken heart or want to reignite passion in their existing relationships. I have many success stories to show that my love work, really works. I’m known as “The Love Designer” because I help people just like you to draft an action plan and redesign their life to become the type of partner that will attract their true match. I’m an architect for love with the tools to help you achieve your ultimate vision. First, you must love yourself and be clear on who you are and what makes you happy. 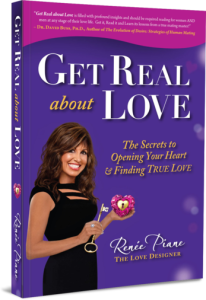 I wrote my new book Get Real about Love ~The Secrets to Opening your Heart & Finding True Love to share my direct approach in a step-by-step system that is proven to help you be honest with yourself and uncover the obstacles that are blocking you from finding love. So, why trust me with your heart? Like many of you, a part of me lost faith in love after experiencing numerous frustrations and disappointments in the dating game. Let’s just say that my pain led me to my passion! I understand your challenges since I was single for many years and my passion for my work took over my life. I was a workaholic wonder woman trying to save the world until I was slowed down by some heavy duty wake up calls. Suddenly, losing my mother to a misdiagnosed heart condition was not how I expected to be forced to take time for love! Soon after, I had another shocking health wake up call when an infected root canal traveled through my body and created a blood clot/aneurysm in my artery in my arm that blocked the nerves in my left hand. My body forced me to slow down to take a good look at my priorities. After eight surgeries and months of rebuilding my immune system, I surely had the time to reflect on how precious each moment of life is during my healing process. This near-death experience only strengthened my passion to share my message with the world to Get Real about LOVE and to listen to the signs that lead us to take care of our hearts and regain balance in our lives! Once I had time to reflect and treat my heart more sacredly, I called in an extraordinary partner who treated me the way I was honoring myself. When I finally met the love of my life in 2002, everyone wanted to know what secrets I had learned after all those years in the single’s world. How did I find real love after forty? I have been happily married to the man of my dreams since 2005 and we love to share our story to inspire people to believe in love again. We are committed to sharing the secrets that help maintain balance in our sacred relationship despite the busy schedules and hectic lifestyle. We are blessed and want to spread more love on the planet! I have years of experience in the dating trenches. Over the last 28 years, I’ve advised singles in their 20s, 30s, 40s, 50s and 60s, many of whom went on to find true love. Experience has taught me so much about the ways different generations and cultures date and helped me to examine the deeper issues people face in today’s mad world of dating. I started out teaching Love Tune-Up classes to single men back in 1990s and discovered that most men never had any official “Prince Training.” This realization led me to start my coaching business and inspired me to write my first book, Love Mechanics. I became the voice and representative for all the wonder women in the world to help men understand women. Since then, I’ve been passing on my secrets to thousands of people with my Get Real about Love coaching, classes and live events. In 2001, I was one of the pioneers for the first non-denominational speed dating company in the US, called Rapid Dating. I have seen people from all walks of life go through the 5-minute dating experience. Rapid Dating was the ultimate way to do research in the singles world! It was fascinating to watch the body language, signals and energy vibes of people while they were meeting. These experiences helped me to gather amazing insights into the dating do’s and don’ts by observing thousands of singles of all ages and cultures at my events. We matched hundreds of couples who would never have normally met each other. To this day, I run into married couples who met at our events and I’m still matching up people all the time. During my career, I also became a clinical hypnotherapist and a certified practitioner of Neuro-Linguistic Programming, Time Line Therapy as well as a makeover expert and image consultant. 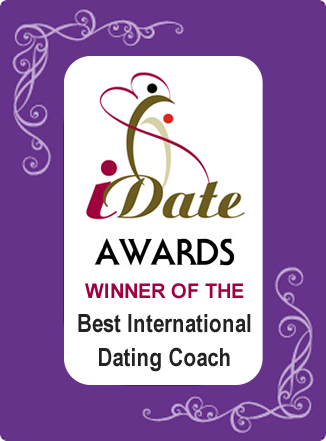 Also, I am proud to have earned several accolades, including being “One of the Eight Resources for Single Men in America” by the Wall Street Journal and the winner of iDate’s 2014 “Best Dating Coach Award”. How do You get started? Now, it’s your turn to take the first step towards finding true love. I can design a personal action plan to prepare you for love from the inside out. If you’re serious about finding true love, contact me online or call me at (310) 827-1100(PST) to set up an initial Love Design consultation. I look forward to meeting you and helping you reinvent your love life and create your new love story!